Battle of Yarmuk (636) - After the Byzantines and Sāssānids beat each other up in the big war (see Byzantine-Sāssānid War), both were left vulnerable to the rising Arab power that began expanding from the south. The Byzantine Empire was in better shape than the Sassanid, for it had won the war and had perhaps the most fortified city on earth in Constantinople. So it did not suffer the same fate as the Sassanid Empire (not immediately), when the Muslims began their attack. But it was still attacked, nevertheless. 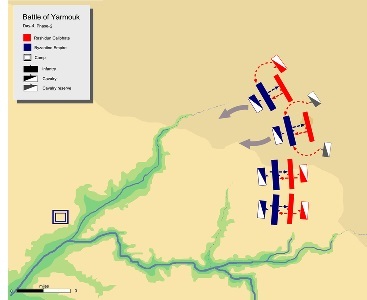 The Battle of Yarmuk was the final leg of the first Arab incursion into Eastern Roman territory. It was fought in 636, four years after Mohammed had died. Omar had become Cailph (2nd Caliph after Abu Bakr), and was determined to build on the conquests of his predecessor. He had at his disposal one of the greatest Arab generals in history, Khalid ibn al-Walid. The campaign began with the penetration of Byzantine controlled Palestina Prima from the south in 634. The Rashidun Caliphate (which was the name of this new Muslim state) had won initial victories at Ajnadayn, Damascus and Fahl (Damascus being the first major Byzantine city to fall into Arab hands). With all Byzantine garrisons in the region now defeated, the Rashidun army continued north, eyeing more land. By now it had caught the attention of Emperor Heraclius, who was readying a counter-attack. Prior to this campaign, the Rashidun army had already sliced off Iraq from the Sāssānid Empire, and the two old foes were now negotiating an alliance against this new threat. 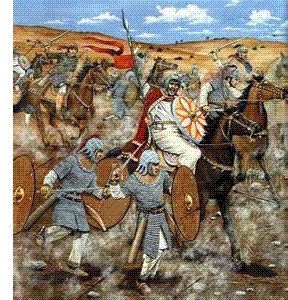 To try to increase his odds, Heraclius convinced the Sāssānids to attack the Arabs in Iraq and take back their territory. The Sāssānids agreed but failed miserably. Their empire was pathetically weak and their emperor, Yazdegerd III, was foolishly young. They would eventually lose the Battle of Qadisiyah, and with it, all land west of Persia, permanently. But back to the Byzantines. By early 636, Heraclius had amassed an army in nothern Syria and was ready to send it south to face the Rashidun army. However, he did not lead it personally as he had done in the Byzantine-Sāssānid War. Command went to several generals as he divided the forces up to cover more ground. However, the Arabs discovered this and decided to concentrate in one place and wait for the Byzantines. Based on accounts, the Rashidun's had about 40,000 troops and the Byzantine army was probably twice that size. The battle took place about 40 miles (65km) south-east of the Golan Heights, on the Yarmuk Plain, next to the Yarmuk River (a tributary of the Jordan). The Rashidun strategy of gathering their troops in one location forced their opponents to do that same, and this would work to the Arabs' advantage, as the plain had natural barriers surrounding it making it more difficult for a larger army to maneuver. It also led to dissension on the Roman side as the various generals quarreled over just about everything (who was in charge, what strategy to employ, etc.). However, in the end, a man named Vahan was regarded as the overall commander of the Byzantine force. The Rashidun army, by contrast was under the command of one very capable military leader. Before the battle began, both sides tried to play mind games on the other. Heraclius commanded his generals to engage in negotiations with the Rashidun officers in an attempt to give the Sāssānids enough time to reach Iraq so they could launch a coordinated attack. But what they didn't realize is that Caliph Omar been negotiating with the Sāssānids in order to intentionally delay battle in Iraq. Meanwhile, he continuously sent small contingents to Yarmuk every day to give the appearance that his army was constantly being reinforced. This made the Byzantines nervous (which was Omar's intention) and after about a month of waiting, they decided to attack. The first day of battle (which was August 15, 636), the two armies lined up and sent their champions out to fight each other (this was pretty common in ancient warfare). It's recorded that the Rashidun warriors got the better of their opponents; and so by midday, Vahan abandoned single combat and ordered about a third of his infantry to attack the Arab line to test its strength. The battle would end up lasting six days, and at the end of the first day when it became too dark to fight, both sides broke off and returned to their camps with not much being decided. Vahan decided to attack at dawn the next day, hoping to catch the Muslims by surprise during their morning prayers. But Khalid had prepared for this possibility and was ready for it. The two sides clashed in standard battle line combat. The center of the Rashidun line held, but their right flank was overpowered and gave way. Khalid moved quickly to reinforce it with his cavalry, and it arrived in time to keep the line from breaking. However, it left their other flank unprotected and that one did break, with it members fleeing back to camp. Now, according to the Muslim sources, when the women in the camp saw their men retreating, they grabbed whatever weapons they could and ran toward them. Whether running to attack them or their opponents, it emboldened the retreating men who returned to the battlefield. By that time, the Rashidun right flank stabilized, and Khalid pulled the cavalry off and sent it to the left to shore it up. The numerically inferior Rashidun army managed to survive the day and both armies returned to camp for the evening. But the fact that the Byzantines were unable to route the enemy demoralized them and lifted the spirits of their opponents. On the third day of combat, Vahan knew he had had the Rashidun right flank on the ropes the previous day and concentrated his attack there, hoping to break through it once and for all and win the battle. Again the right flank of the Arabs began to give way, and again the women were said to have stood behind their men and hurl insults at them for weakening. Whether or not it actually impacted the battle, the right flank held just long enough for Khalid to protect it. Once again he concentrated his cavalry there and even sent his personal guard in to make sure it would hold. The day ended with the Rashidun line still holding its ground. The fourth day of battle, Vahan decided to employ the same tactics yet again, and Khalid, anticipating this, opted to change them. 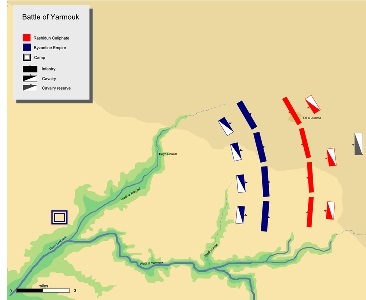 Vahan concentrated his attack again on the enemy's right flank, so in the midst of fighting, Khalid ordered his right to separate from the rest of the line. This created a space in between the right flank and center, and Khalid drove part of his cavalry through this space. The rest of his cavalry rode around the other end of right line, and the two surrounded to Byzantine left flank. The tactic was successful and it was the Byzantine line that was forced back. However, the battle was still not decided because on the other end of line, the Byzantines had inflicted heavy casualties on the Arabs. Their arrows found many men and blinded them. It is remembered in Muslim history as the "Day of Lost Eyes". But at the end of the day, Vahan realized that his plan to break the Rashidun line had failed and his men were demoralized. The next morning, he sent a messenger to Khalid requesting a truce until their leaders could asses the situation. Khalid knew the Byzantines were in trouble and rejected the offer. As a result, he also chose to change his strategy. Up to then he had employed a largely defensive posture. Now he decided to go on offense. He concentrated all his cavalry in one spot and tried to use it as a hammer on the Byzantine line. But, he did not quite have the numbers yet to finish the battle, and day five ended without a victory. However, Khalid sensed it was close and that night sent troops out to block the three avenues of retreat from the battlefield. The next day he changed tactics yet again in order to finish the battle. He felt his infantry was now stronger then his opponent's, and used his cavalry to route the Byzantine cavalry. Up until then, he was unable to separate it from his infantry because of his inferior numbers. Now the Byzantine infantry was unprotected, and the Rasidun infantry overwhelmed it. Most of the army was destroyed, but thousands still managed to escape, despite Khalid blocking the exits. Khalid ibn al-Walid defeated a larger army by employing a defensive strategy until he whittled it down to a point where he was able to crush it. The battle ended with an Arab victory and wrested Syria from the Byzantine Empire, putting it into Islamic hands.